Learning to play the ukulele doesn’t have to be hard. And with the Populele, the world’s first smart ukulele, it’s now easier than ever. Imagine learning to play the ukulele without paying for classes, scouring YouTube for tutorial videos, or deciphering utterly confusing chord sheets. Instead, picture a ukulele that will show you exactly where to place your fingers on the fretboard and actually playing songs in your first attempt. Populele originally came to life in the form of an Indiegogo campaign by a New York City company called PopuBand Music Inc., where it was pitched as a fun and satisfying way to learn an instrument in minutes. When paired with its free app for Android and iOS, it teaches the user: chords, finger placement, and timing – all through a friendly gamified interface. I was sent the complete Populele set with accessories, which usually retails for $249 but is currently available for just $169 (30% discount) for a limited time. So if you know someone yearning to play the ukulele, this is probably the perfect gift! The standalone Populele kit is also discounted by 25% for a limited time, so you’ll be able to pick it up for just $149. 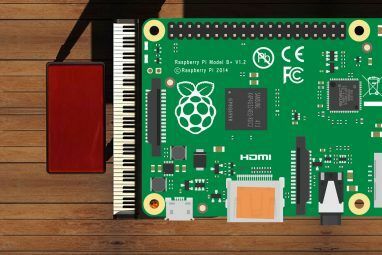 The complete kit includes the Populele, a full-size ukulele, a carry case, capo, a couple of picks, a micro-USB charging cable, and a spare set of strings. 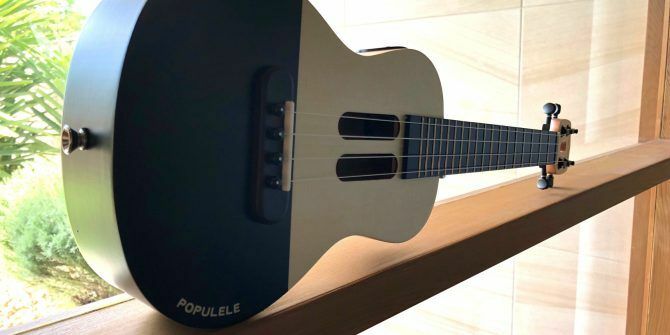 The Populele itself looks like a conventional ukulele but is, in fact, very different. What sets it apart is the ABS fretboard and 72 LEDs embedded within each fret spaces which illuminates to guide finger placement. You’ll also find the charging port and on/off button on the side of the instrument. Overall, the Populele feels very well made and sounds pretty good too. Before we can get any music going, it needs to be charged. While charging through the micro-USB port, between one and four LEDs on the fretboard light up to indicate the charge status: one LED for 25% charge, two for 50% charge, 3 for 75%, and 4 solid LEDs mean the Populele is fully charged. It takes about a half hour to bring the Populele to full charge, and that will last at least a few sessions, easily. You may also use the Populele while charging. Once it’s batteries are juiced up, it’s ready to rock and roll. The Populele easily pairs with any smartphone via its Android or iOS app, then it will go through a simple tuning process. Just pluck the highlighted string and the app will indicate whether it’s in tune to needs to be adjusted higher or lower. It’s recommended to tune the ukulele before each use as the games within the app will listen for the chord notes to determine if your finger placement is correct. If the ukulele is out of tune, the games won’t work, or it’ll just seem really frustrating since the app will tell you that you’re doing it wrong and won’t let you move on to the next stage! The gamified learning process makes it really fun and super easy to learn how to play the ukulele. The app displays the exact fingers to use and the positions on the fretboard to place them. And if that’s not simple enough, the fretboard will also light up to show you where to press in order to form the chord. Transitioning from one chord to another is the hardest part of learning how to play a ukulele (or guitar for that matter), and so the first few games are aimed right at this. It focuses on chord transition and timing. Once you’ve mastered this, then it’s time to move on to the fun stuff – songs! The Populele app has quite the song library and is updated quite frequently. 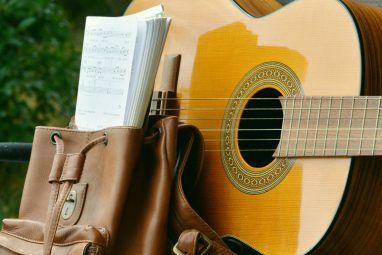 The chords used and strumming pattern for each song are shown right after selecting a song. When you’re ready to proceed, the app will play the song’s basic rhythm, making it easier for you to play along. Honestly, this single part of the app makes the Populele shine. Strumming along to a familiar song a few minutes after picking up a ukulele is truly satisfying and undoubtedly builds confidence. This feature alone makes the Populele worth buying. Unfortunately we can’t have just pocketfuls of sunshine, can we? There are just a few niggly bits to go through. First and foremost, if you’re a leftie, you’re going to have a hard time with the Populele. It was designed for right handers who strum with their right hand and hold the fretboard with their left. And it’s not as easy as flipping the ukelele over to form chords with your right hand either, unless you’re happy to learn those chords upside-down. Even so, you’d have to adapt to the inverted strumming pattern, which makes the entire learning process quite difficult. With a traditional uke, you could switch the strings around to form chords and strum the correct way up, but not with the Populele, unfortunately. 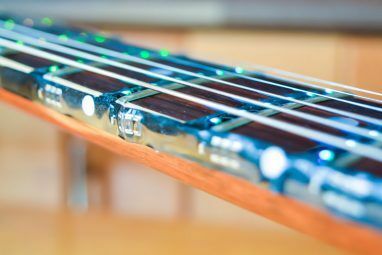 The fretboard will illuminate for the right-handed configuration only. Perhaps future app and firmware updates will accomodate lefties but in this current versions, it’s really a dead end. At least with the Android version, not all of the content (tutorial videos, song chords) is downloaded with the app from the Play Store. So loading time between games and songs can be a pain to sit through, especially when you’re all excited about learning. Once that content is download, it’s cached locally and is much quicker to load. It’s a minor sore point but worth highlighting anyway. As mentioned earlier, the complete Populele kit goes for $169; $149 for just the instrument. Conventional ukuleles are available from Amazon for less than a third of the price. So you really need to ask yourself: is the Populele worth the premium? As a musical instrument, probably not, since the price point is a really high barrier to entry. If you’re already familiar with stringed instruments (guitar, banjo, etc), you’ll get better value for money with a regular uke. However, as a learning experience especially for young children, the Populele could be worth that extra hundred or so dollars. Yes! This would help me teach my Niece and Nephew the Uke. Thanks for the giveaway. This uke would be just perfect for our grandson to commence music lessons on. I wish I win this giveaway, Populele would be a great Xmas present for my sister!